An elder of the Arewa Consultative Forum, ACF, Joseph Waku, on Tuesday, said the President Muhammadu Buhari’s anti-corruption fight will be seen to be effective if he probes former President, Oluesegun Obasanjo. Waku, a former Senator from Benue State, said this while addressing reporters at the sideline of the ongoing Annual General Assembly of the Arewa Consultative Forum in Kaduna. 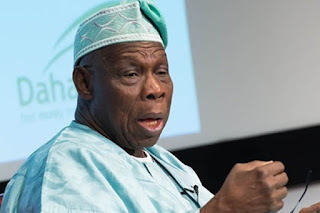 Wondering why the Economic and Financial Crimes Commission, EFCC, had left Obasanjo untouched, Waku stressed that Nigerians would not take Buhari’s fight against corruption seriously if the likes of the former President went about freely. Waku said, “Look, I am 70 years old now and have been in this game for more than 50 years. “Therefore, there is no way I can just look at some totality of what people are saying about corruption and believe it as it has been reported to me. If I have an investigating mechanism, I know that this accusation is real obviously.